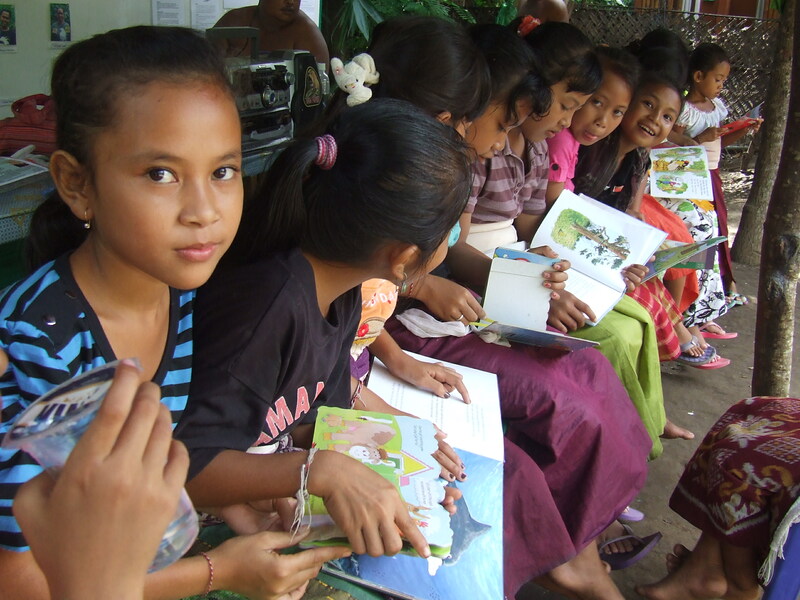 Children reading books at our community and conservation centre on Nusa Penida island. Our Nusa Penida habitat restoration and conservation, community development and volunteer programs support and give back to the local people who protect endangered birds from poachers and traffickers, under local traditional law, working together with FNPF to save the Bali starling from the brink of extinction in the wild. In return for community assistance, FNPF provides a range of community programs to the people of Nusa Penida. New at FNPF Nusa Penida!!!! Launching in 2015, New FNPF “Classroom on Wheels”: a mobile community education van sharing knowledge to schools and villages – and future mobile community radio station too (depending on equipment & transmission funding)! FNPF is excited to announce the new Nusa Penida Community Centre – a conservation, sustainability and volunteer’s village – headquarters of Bali Bird Sanctuary, home to the endangered Bali starling conservation breeding centre, the Sea Turtle Saver project, FNPF island reforestation programs, organic market gardens, and a community facility for local development training and host village to global volunteers; opening in 2015! FNPF has successfully raised and released more than 140 Bali starlings at the FNPF Bali Bird Sanctuary on Nusa Penida, since 2007. Bali starlings can be seen in gardens, temples and forests around the village of Ped. Every year, tens of thousands of native tree saplings are grown in the FNPF nurseries to restore habitat and improve environmental conditions on this island bird sanctuary. FNPF will continue intensive reforestation programs on Nusa Penida as a key complement to the successful endangered bird conservation breeding facility – relocated to the new FNPF Nusa Penida Community Centre. Declared a Marine Protected Area in 2014, Nusa Penida and the FNPF Sea Turtle Saver monitoring station on the island’s east coast is now also part of the Coral Triangle of countries protecting marine habitats – including Indonesia, Malaysia, Papua New Guinea, Philippines, Solomon Islands and Timor-Leste. FNPF offers many opportunities in conservation and community development in our programs on Nusa Penida island – off Bali – for volunteers who wish to stay for a few days or longer-term during study holidays, gap years or retirement vacations. For more information on volunteering at FNPF Nusa Penida and other FNPF volunteer destinations check our Volunteer pages in How You Can Help. This work has been possible thanks to our donors, including the Humane Society International (Australia), Australian Consulate in Bali, Maya Ubud Resort and Spa and the Rotary Club of Bali Seminyak.